In the aftermath of tragedy, we must be about the Father's business. Obama is in Cairo today and he gave his friendly speech to the Muslim people. The unprecedented excitement prior to Obama's arrival reached a fever pitch when shops began selling pendants labeled "Obama – new Tutankhamen of the world." President Obama claims he is a Christian, yet he has reneged on his campaign promises. He says he is a Christian yet his Notre Dame speech on abortion was positively chilling. He says he is a Christian yet he promotes the gay lifestyle and all its attendant perversities: did you know that Obama proclaimed June Lesbian, Gay, Bisexual, and Transgender month? No...Obama is looking more like Pharaoh all the time. In the bible, God judged Pharaoh harshly because of Pharaoh's insistence in doing things his way instead of God's way, and that after seeing the proof of God's miraculous judgments throughout the land. I do not know what God will do, of course, but I do know America is ripe for judgment. I think it is highly interesting that the Egyptian people are calling Obama a Pharaoh. And as a real Christian, the last person I'd want to be compared to is Pharaoh." "America seems ripe for judgment"... The discerners of the church body have been saying 'judgment in America' for a while. I know I have since 2007-2008. In 2010 I'd written that America seemed to have passed the "point of no return. Before the Economic Crash of 2008, all had been going along like it had been in this country. America was strong and mighty and seemingly invincible. Warning that judgment was coming soon was met with strange looks and shaking of heads. No brimstone was falling, after all. Just because we don't see brimstone falling from the sky does not mean we as a nation are not experiencing judgment. Many people think of judgment as the kind that occurred at Sodom and Gomorrah: brimstone from the sky and obliteration of the entire city. (Genesis 19:24). And that IS one kind of judgment. Bible Fact: There are 13 mentions of brimstone (sulfur) in the Bible. Six mentions are in the Old Testament. Seven mentions are in the New Testament. Of the 7 mentions of brimstone in the NT, six are in Revelation. The wrath of God is not one-dimensional. There are in fact many different kinds of wrath that God displays. Hosea 5:12 says "He is as a moth to Ephraim or or dry rot to Judah", working silently and invisibly. In his 2012 sermon "When God Abandons a Nation", John MacArthur outlined five distinct kinds of wrath the Lord has displayed throughout the Bible. 1. Eternal wrath: that is the punishing eternal, judgment God brings upon sinners in their death. 2. Eschatalogical wrath: God's stored-up anger unleashed at the end of this present age upon the world, promised by Old Testament saints, outlined at length in Jesus' Olivet Discourse, and seen unfolding through Revelation. 3. Cataclysmic wrath: These are tsunamis, hurricanes, earthquakes, etc., the result of sin and the curse upon the world. 4. Consequential wrath: this is a person receiving the just due for their actions while on earth, the sowing and reaping. 5. 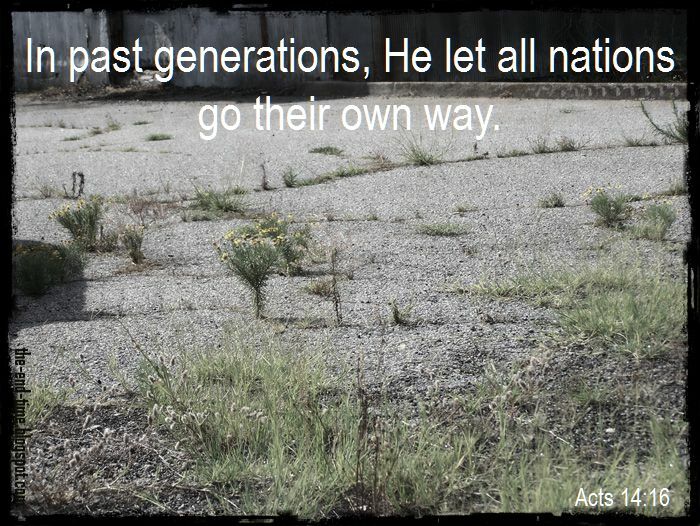 Abandonment: This is the wrath seen in Romans 1:18-32. MacArthur preached, "God will abandon sinners to their own choices and the consequences of those choices. And just what is this abandoning act on God's part, it is the removal of restraining grace. It is when God lets go and turns a society over to its own sinful freedoms and the results of those freedoms. No Scripture more directly confronts this abandonment and its consequences than Romans 1 does." A Hillary Clinton presidency would be a Jezebel judgment in my opinion. MacArthur said in that 2012 sermon that "It's pretty convincing that God has abandoned our nation." 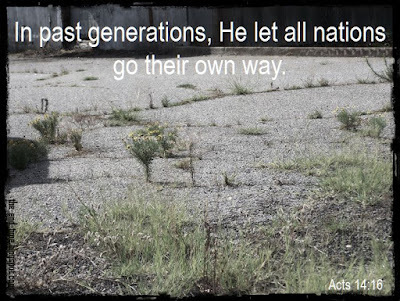 God has done so in the past to other nations, many times. In Hosea 4:17 it is recorded that God said, "Ephraim is joined unto idols, let him alone." America isn't special that we should not expect the same treatment as other rebellious nations when we abandon Him. I've been thinking about the real possibility of a woman for president. I am working through the Bible to determine what its stance is on women in political leadership. Queen Esther was a queen, but she didn't lead and had no influence. Queen Jezebel led, and she did have influence- evil influence. In this life, we have seen successful women leaders in Queen Elizabeth 1, Golda Meir, Margaret Thatcher... Since God ordains leaders for His purposes, He allowed those female leaders to serve His inscrutable purposes by leading for a time. Yet in the Bible we read in Isaiah 3:12 that it is a national shame for a woman to lead, My people—infants are their oppressors, and women rule over them. Barak begged Deborah to accompany him on the military campaign and she said OK but it will be a shame to the men. (Judges 4:9). I see the political pundits saying that a Trump presidency would be a judgment upon America, but what about a Hillary presidency, a female president? That would also be a judgment, I believe. A Jezebel judgment. Do the people of a nation under the wrath of abandonment know it is happening when it is happening? Non-believers don't of course, and even most believers don't. But the Prophets certainly did, and it was a deep lament to them. I've sensed for a while that America was under judgment, as I mentioned at the start. So have a lot of other people. Some who have a pulpit occasionally use it to calm their flocks and re-orient them to a biblical perspective. To that end, at specific points in his 47-year pastorate at Grace Community Church, John MacArthur would do this. My opinion is that he is a man like the men of Issachar, as 1 Chronicles 12:32 describes, "men who had understanding of the times, to know what Israel ought to do;" and as Treasury of Scripture describes, "intelligent men, who understood the signs of the times, well versed in political affairs, and knew what was proper to be done in all the exigencies of human life". These culturally-focused sermons have struck a chord with me at the few times he used the pulpit this way. They have helped me make sense of what is happening around me in terms of God's sovereignty and His ordained plan. There is a lot to think about with this Fall's Presidential election. Phil Johnson has been vocal about the two main party candidates. As recently as this week he said on Facebook that Donald Trump is an inveterate narcissist and a shameless adulterer, and the other candidate, Hillary Clinton, is a pathological liar with a Jezebel complex, and that both are blatant antichrists and utter moral reprobates. Wow. A sobering thought. Even though brimstone is not falling, if the moths have been at work and for example, if we are attacked by an eager enemy, the righteous die under the bombs and fallout just as much as the unrighteous. So I list these helpful, biblically re-orienting sermons so that perhaps if you listen, you might yourself become re-oriented to God's word and take hope in our future and live in peaceably in His joy. Abandonment leaves a vacuum, and we already see the enemy horde from the spiritual realms advancing with maniacal glee to take up ramparts. California: A state bill intended to restrict Christian colleges and schools from discriminating on the grounds of sexual orientation, gender identity, and gender expression. The above two bills are serious and if passed, impacts could be widespread with a cascading negative effect on all American churches and Christian colleges. It's coming. Therefore, I offer these cultural/biblical sermons for your consideration. They have all helped me, some more than once. I hope they help you as well. And so, we are under His wrath. That brings the question...is there any hope? Is there any hope for this country, for any society in this condition? Well, I will take you to a passage of Scripture that gives us hope. Turn in your Bible to the Psalms, and I want you to look at this, Psalm 81...Psalm 81 because this cycle is a constantly visible cycle in history, going on all the time. It has happened before in Israel. It is happening even now in Israel. Many generations of the Jewish people, God's chosen people for a future redemption, many generations have gone through this cycle, rejecting the true God, rationalizing about their condition, inventing complex religion, descending. Is there any hope for them in the future? Is there any hope for the western world? For any nation in the world? For us? This is not about politics, although there are things we could talk about. You’re not voting for a pastor, you’re not voting for a spiritual leader, you’re voting for someone who has some sense of morality. Since the Bible says that the role of government is to punish evil doers and protect the good, you better have somebody in power who understands what is good and what is evil. One of the parties, the Democratic Party, has now made Romans 1, the sins of Romans 1, their agenda. What God condemns, they affirm. What God punishes, they exalt. Shocking, really. The Democratic Party has become the anti-God party, the sin-promoting party. A lot is happening at a very rapid rate. And with all the discussion that’s been going on, I’ve been kind of eager to get to you, and maybe help to give you a perspective. ... This nation, at its highest level, has taken a position against God. Such blasphemous rebellion is energized—it is energized by the corruption of the collection of sinful hearts, which make up this nation or any nation. There’s no question about that. There are 4 methods God uses to restrain evil in society: the conscience, the family, the government, and the church. My friend Greg Flowers summarized the next two sermons this way: "Pastor John emphasized the nation’s need to respect the law of God to prevent its own destruction, and declared God’s standards as the only standards by which a nation is measured. While acknowledging Christians' inability to bring an entire nation to worship at the Master’s feet, MacArthur stressed the fundamental need to see the one true God elevated above all other gods." My good friend Iain Murray said this: “A secular state is a lie. Government is a divine institution. The powers that be are ordained of God.” America likes to talk about the separation of church and state. Of course, our constitution doesn’t say that. But the separation of church and state, which is now the new perspective that dominates everything is essentially paving the way for the death of a society. The truth of the matter is God has requirements for all rulers, all those who have authority over people, and it’s laid out in Scripture. ... I told you that all people in all nations were created in the image of God for His glory, so no one is exempt – no person is exempt, no family is exempt, no society is exempt, no nation is exempt, no race is exempt, no ethnic group is exempt from being responsible to acknowledge God and glorify Him. All people who are created, were created in the image of God for His glory. The day is sobering and the times are troubling. We all strive to display the joy of Christ in our daily life, to persevere in and aura of hope and peace. We know to be gentle and humble, and to love our friend, neighbor and enemy. But there is no doubt that the times demand of us a careful attention to the Bible and its paths, more than ever in fact. We don't like to be downers but we also don't ignore the fact that we are living in difficult times that are on the precipice of being massively more difficult soon. We know that God created each person on earth specifically and for a specific purpose in their era. If I am here now, for just such a time as this, what can I do to both advance the kingdom like I'm supposed to, and also prepare for the times ahead? We must do our diligence to lift Jesus' name to the highest with all our strength, soul, mind, and heart. According to prophecy, I believe we can fully expect things to worsen...and (another) Clinton presidency would certainly accomplish that. God forbid that our nation would be ruled over by Hillary, but I actually believe that just may be God's plan to bring about His purposed end. But the calm in the midst of the storm is keeping in mind that God rules over the affairs of men and God raises up kings and that He's working all things together for good to those whom He has called. God has a way of preparing His chosen ones to let go of this world and look up for our blessed hope, the appearing of our great God and Savior, the Lord Jesus Christ. My neck is getting sore these days. Thanks Sheryl. You always have a wise and spiritually helpful comment. The times are awful but I have total trust in Jesus and God. It's a great time to be alive - to get closer to Him and bring our lives into line.